Sail to Bermuda and the Caribbean in luxury and style. Celebrity Cruises is redefining modern luxury. Sophisticated adults looking to be pampered during a relaxing vacation are particularly drawn to Celebrity cruises, as are young honeymooners looking for a romantic getaway. Family members are also welcome, with entertainment options catering to every age group to make sure every passenger has a memorable time. Quiet lounges and spacious sun decks provide plenty of places to relax, and luxurious spa treatments offer the latest in health and beauty trends. Celebrity cruises a foodie’s dream come true. The menus are designed by Michelin-star master chef Cornelius Gallagher, allowing every passenger to enjoy five-star dining with every meal. Daily demonstrations, workshops and behind-the-scene tours are sure to please hobby chefs and food enthusiasts alike. And for the aspiring sommelier, Celebrity’s wine collection features more wines than there are days in a year. Cruise like a star with the Celebrity Solstice! Her sleek, modern finish and elegant design offer a thoroughly modern take on what cruising should be. Enjoy top-notch wellness facilities, experimental cuisine and live glass-blowing demonstrations on this luxury cruise ship. 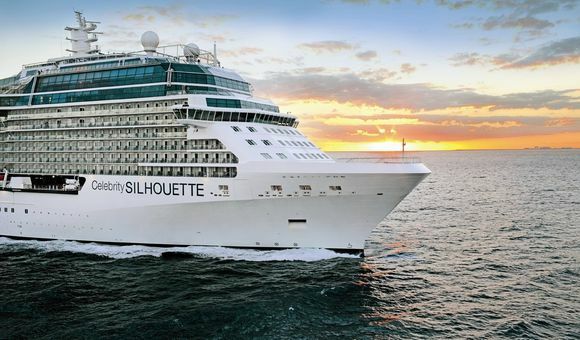 A Solstice-class ship, the Celebrity Eclipse is a modern wonder. Its sleek interior and state-of-the-art design make it one of the most stylish ships at sea, and its modern amenities and high-class atmosphere reflect Celebrity's commitment to "redefining modern luxury." Enjoy a luxurious tropical getaway onboard the Celebrity Summit. The Celebrity Millenium is a sophisticated, mid-sized cruise ship offering unforgettable journeys to exotic destinations, primarily in the Pacific. Enjoy five-star treatment and mingle with the finest onboard this modern luxury cruise ship. Experience the best of cruising with Celebrity Silhouette. Its impressive features like the interactive Lawn Club Grill and Qsine will make your cruise around Europe and the Caribbean unforgettable. The Celebrity Xpedition takes an intimate group of passengers on adventurous, excursion-heavy journeys to the Galapagos islands. With just 96 passengers and no dress code, the trips place a strong emphasis on nature and exploration. Celebrity Constellation is the ideal way to cruise. The welcoming service, superb dining options and an array of facilities to keep you entertained are sure to make for an unforgettable trip. The Celebrity Infinity is an outstanding mid-sized luxury cruise ship embarking on voyages to popular destinations in the Mediterranean, Alaska and more. Enjoy the understated modern elegance and quality fine dining onboard. Celebrity Reflection, the biggest ship in Celebrity's Solstice Class, is full of ways to make your precious holiday time unforgettable. The latest ship in the Celebrity fleet, the Celebrity Edge is in a class of its own. With revolutionary new technology and innovative design, this ship is re-imagining the standard of modern luxury. Celebrity Flora is a boutique ship custom-built to explore the Galapagos Islands. Launching in 2019, she’ll reach new heights in premium onboard experiences, an elegant, modern design, and environmentally-friendly cruising. Sister ship to the acclaimed Celebrity Edge, Celebrity Apex will launch in April 2020. With innovative new features, a contemporary look and design, and one-of-a-kind experiences, the Celebrity Apex will raise the bar in the world of premium cruising. Celebrity Cruises is revolutionizing their fleet! In 2019, Celebrity will begin a fleet-wide modernization process known as the “Celebrity Revolution,” starting with the Celebrity Millennium. They expect to complete the process by 2023. The new staterooms will radiate with new splendor, and the newly-designed ships will provide guests with a revolutionary cruise experience. Guests who book a luxury suite on the refurbished ships can look forward to exclusive access to the Retreat Sun Deck and the Retreat Lounge. Redesigned versions of the restaurant Qsine and the Oceanview Café will continue to deliver culinary highlights following the redesign. With this modernization, Celebrity will bring the cruise ship experience on every ship in its fleet up to par with that of the Celebrity Edge – its newest ship, which launched in December 2018.